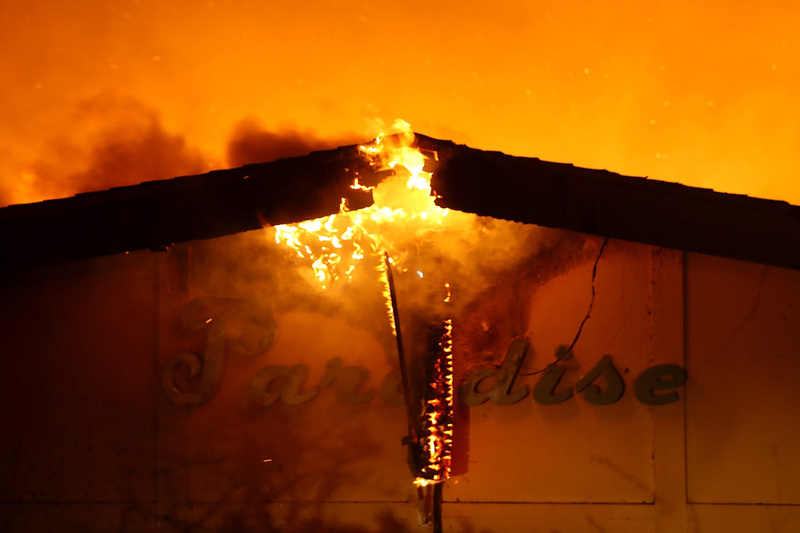 The Camp Fire destroyed almost the entire town of Paradise, California. Climate change is making all extreme weather disasters worse, including wildfires, hurricanes, heat waves, and more. A new report on climate change released (believe it or not) from the Trump administration delivers more bad news about what mankind is doing to the planet. Too bad we’ve heard it all before. But we need to start listening — and acting. The Fourth National Climate Assessment, mandated by Congress, was due to come out in December but was released early by the Trump administration on the traditionally busy shopping day of Black Friday after Thanksgiving. No doubt Donald Trump and the fellow climate deniers in his administration thought they could bury the report’s bad news in a Friday news dump, but, because there was so little actual news, it’s been picked up everywhere. Oops. Weather. More frequent and intense extreme weather and climate-related events will damage infrastructure, ecosystems, and social systems that provide essential benefits to communities. That means drier droughts, higher-temperature heat waves, more severe wildfires, and hurricanes that bring even more rain. Economy. Climate change will mean the loss of “hundreds of billions of dollars by the end of the century” to the U.S. economy because of growing losses to American infrastructure and property. This is similar to another recent report that estimated the U.S. loss at $250 billion, but that estimate could be measured against the annual economy before too long. Water. Rising air and water temperatures and changes in precipitation are intensifying droughts, increasing heavy downpours, reducing snowpack, and causing declines in surface water quality. Health. Rising air and water temperatures and more intense extreme weather events will “increase exposure to waterborne and foodborne diseases, affecting food and water safety.” This is on top of higher instances of heatstroke, more asthma, and more environmental allergies. And too many other health concerns to mention. The report was compiled and written by 13 federal departments and agencies and stretches for more than 1,000 pages. There are 12 main areas in the report, and they’re all depressing. “Global action to significantly cut greenhouse gas emissions can substantially reduce climate-related risks and increase opportunities for these populations in the longer term,” the report says it its summary. Check out the Atlantic shores at Mar-a-Lago, Donnie-the-denier. They’ll be underwater soon, just as rising sea levels are causing more flooding all along the Florida coast and up and down the Atlantic seaboard. Some thoughts on the @IPCC_CH #SR15 report. This is a fairly famous quote about climate change. It was brought up again in light of the latest report of the Intergovernmental Panel on Climate Change that was released in October. It should be stressed again now. In January, the U.S. House of Representatives will be run by Democrats. They should — and no doubt in time will — take seriously the recommendations of the “Green New Deal” that is being championed by incoming New York Rep. Alexandria Ocasio-Cortez, other progressive groups, and (so far) a handful of House Democrats. What are we waiting for? For the Earth to get too hot for our children and grandchildren? ← Mercy Hospital shooting: A domestic dispute, more gun deaths. When will it stop?